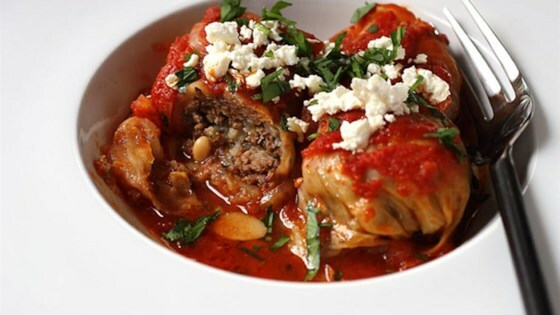 "I love lamb burgers and lamb meatballs, so it's no surprise that I love lamb-stuffed cabbage rolls, and I'm happy to report that these particular 'lambage rolls' were the best non-beef version yet!" Melt butter in large skillet over medium heat; heat oil in the melted butter. Cook and stir 1/2 diced onion until translucent, about 8 minutes. Add garlic and cook and stir for 1 minute. Remove from heat. Stir in 1 teaspoon black pepper, cumin, cinnamon, cayenne pepper, and oregano. Set aside to cool to room temperature. Combine lamb, rice, 2 teaspoons salt, 1/4 cup parsley, almonds, and currants in a large bowl. Add cooled onion mixture and mix until combined. Cover and place in the refrigerator until ready to use. Fill a large pot halfway with water and bring to a boil. Remove the core from the cabbage head and place the head in the boiling water. Cover and simmer until leaves begin to fall away, about 5 minutes. Remove the 2 outer layers of leaves to a paper towel-lined plate, cover and continue cooking for 1 to 2 more minutes. Remove the remaining large leaves to the plate. You will need 8 large and about 7 smaller leaves. Take 1 cabbage leaf and remove the root end. Place about 1/2 cup of the lamb mixture toward the bottom edge of the cabbage leaf and roll into a log. Repeat with remaining lamb mixture and 7 more large leaves to create 8 cabbage rolls. Line the bottom of a large casserole dish or Dutch oven with 4 or 5 smaller cabbage leaves. Place cabbage rolls on top; season with salt and black pepper. Add bay leaves and tomato puree. Pour in chicken broth. Sprinkle 1/2 sliced onion over the top and cover with 3 or 4 more cabbage leaves. Cover casserole. Bake in the preheated oven until the lamb is tender and the rice is cooked, 1 hour and 15 minutes to 1 hour and 30 minutes. Remove from the oven and allow to rest for 30 minutes. Serve with pan juices poured over the top and garnished with feta cheese and 2 tablespoons parsley. It was better when I used uncooked rice as opposed to already cooked rice but amazing every time! This was a hit with my family. Making it agaIn tonight for the 2nd time in a week.